Thanks to a few big boxes of Christmas decorations we uncovered during my parents’ downsizing, I’ve been on a trip down memory lane. Growing up, Mum always decked the house to the hilt. She draped handmade Christmas blankets on every chair to keep us cosy. We had Christmas centre pieces, doorknob hangers, advent calendars, Christmas card holders, and festive linens galore. Dad, my sister and I were in charge of the tree. It was always real and no matter how carefully we chose it there was an inevitable weird, sparse side we didn’t discover until the tree was half way decorated. 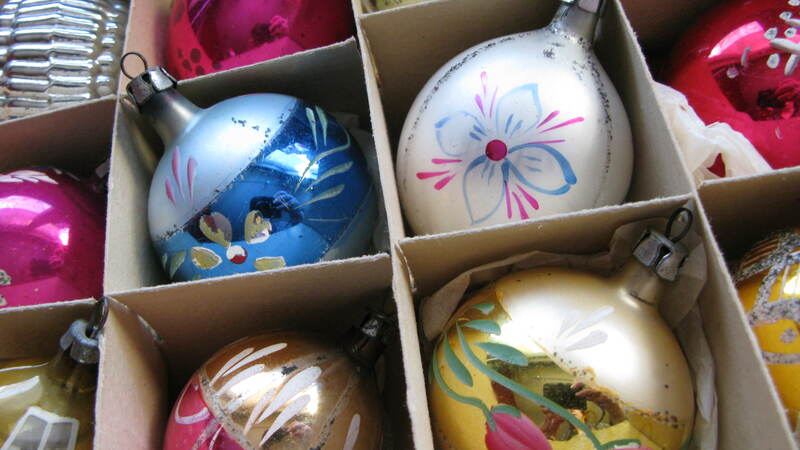 And then there were the boxes of bright, delicate glass ornaments; the kind with the hand painting and indented centres; they’re still my favourites. The final touch was the tinsel. Strand by strand we would place it. Occasionally, I may have tossed a small clump or two- I’ve never liked things too perfect! The tree was flanked by “giant” plush Santas; there was a time when I remember they seemed as tall as me. There were elves, little bottle brush trees and a Christmas village that I loved to set up in a cloud of angel hair. When this transformation took place the air also filled with the sweet, spicy smells of lots and lots of baking. Everyday in December it seemed like we would come home from school and be greeted by wire cooling racks full of the day’s bounty. As a teenager this magical setting had the power to enchant me out of the basement where I usually holed up and actually hang out in the living room. For all this evocative stuff what I mostly remember is how warm and loving our home felt. 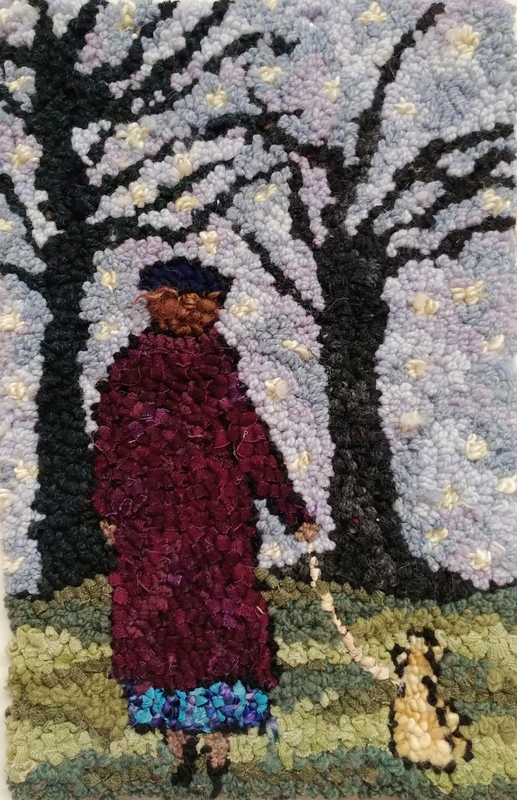 Not unlike a lot of families,there were difficult times yet Mum knew how to carve out this special time and space to acknowledge the meaning of the season and be grateful for each other. Whether that means a simple star, evergreen bough or a houseful of decorations to you, I think it’s important to do what we need to do to find the meaning amongst the chaos and bring those we love close. The smallest gesture can create the most loving moment. This afternoon, I’m taking a few of these markers from our Christmas’past and doing a little bit of decorating on my parents’ mantle in their new condo. These decorations have been boxed up for so many years I think it’s time they sprinkled some of that love again. Maia, I think your Dad might have been onto something. A tree full of tossed tinsel sounds lovely to me! 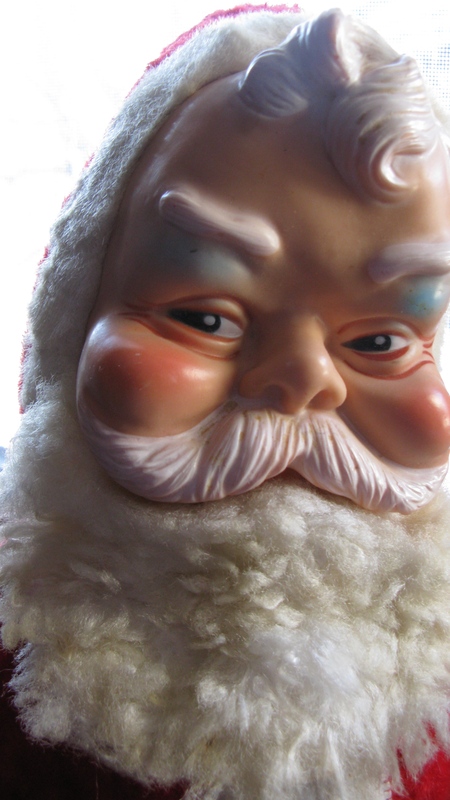 Thanks for sharing your Christmas memories! I’ve never experienced a tree lit with candles. It must be so beautiful. Thanks for sharing Sandra. Merry Christmas! Merry Christmas Allyson! You must rescue those Santas! Thanks for your thoughts Carol- it’s always nice to know a post resonates. Merry Christmas! Merry Christmas Charlotte! Those ornaments get more special with time don’t they. I so enjoyed this, Diane. 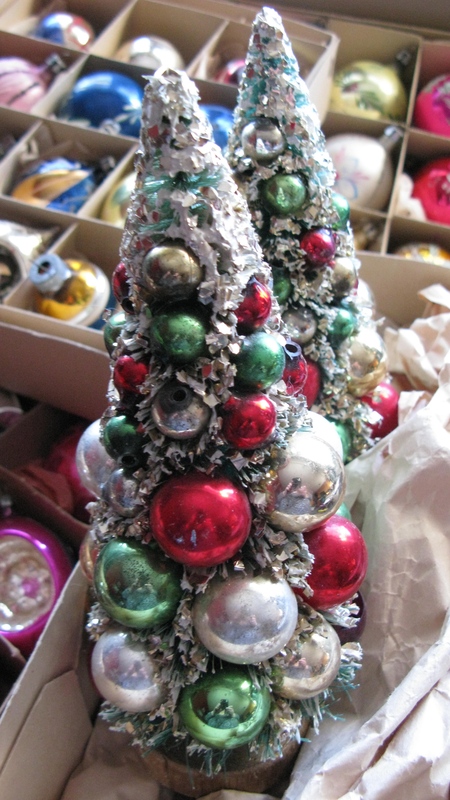 In your boxes I recognize ornaments from my own family Christmases – in my case, from my grandparents. You take me back to decorating our tree, which Dad always “completed” by tossing great handfuls of tinsel onto, much to my Mother’s chagrin! We kids thought it looked lovely. Now I lovingly hang ornaments from Nanna & Grandpa, plus many that family members have made over the years. And I remember ….. 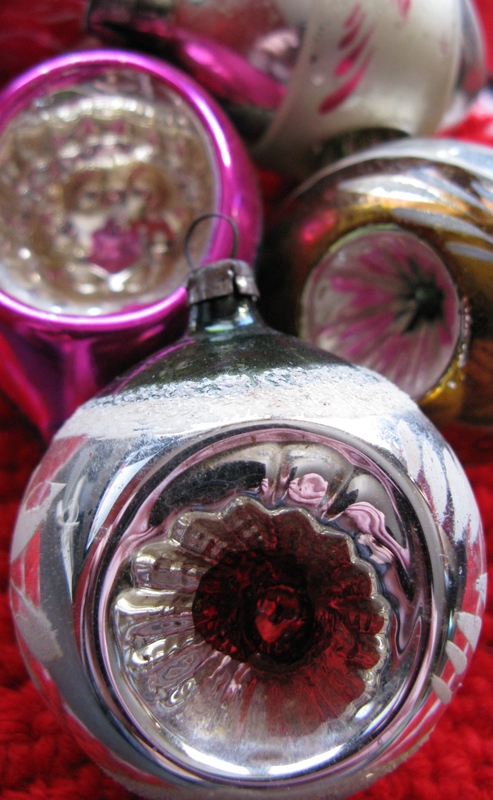 When I was little both my grandparents and my parents decorated their trees with glass ornaments (some I recognize above) — I loved how they sparkled! Luckily, I acquired both sets when my grandparents passed away and when my mom switched to plastic. Each year my kids and I decorate our live fraser fir tree with those Christmas ornaments from my childhood. Once the ornaments (both old and new) and tinsel are on, we finish off the tree with 24 Swiss candle holders (yes, we light real candles) which were a gift from my husband’s childhood (Swiss grandparents). We have a 4-generation Christmas tree! oh my goodness, as I read your post I was feeling like you were writing of my childhood. 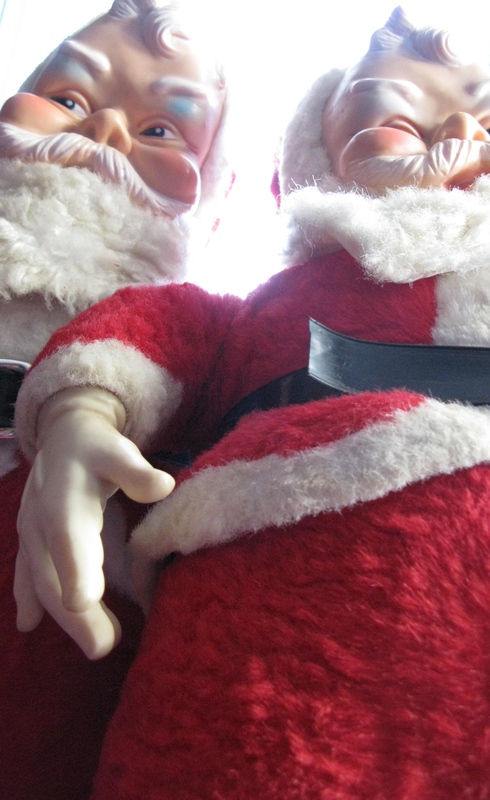 And lo and behold, there they are….the same Santas!!! Somewhere buried in a storage facility somewhere at my mom’s condo there should be at least one or two of these fellas. Must find them. Just seeing that picture makes me tear up. Merry Christmas to you.